The EIT Regional Innovation Scheme (RIS) is a dedicated programme to accelerate climate innovation across Europe. 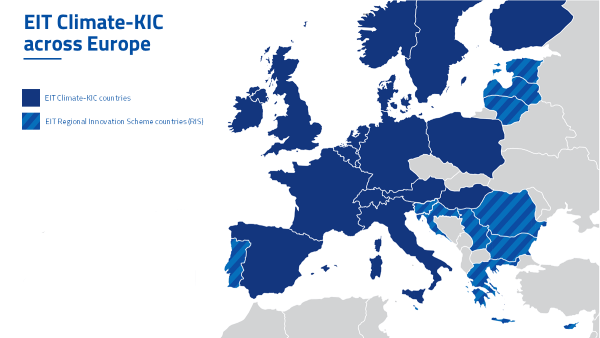 It facilitates connections into our established innovation hubs, in 12 countries in the centre, east and south of Europe, securing EIT Climate-KIC’s pan-European reach, boosting climate innovation capacity across the continent. Southern and eastern Europe face some of the most acute climate adaptation risks and projected economic and societal costs of climate change. EIT RIS eligible countries also encompass some of Europe’s largest greenhouse gas emitters in the industrial and manufacturing context and through poor energy transition. The EIT RIS aims to stimulate low carbon innovation in countries, regions and cities across Europe and significantly boost local capacity to implement the highest impact ideas, while reinforcing synergies and complementarities with EU, national, regional innovation initiatives and funding sources. It is a strategic instrument to target the climate mitigation needs and challenges. With a focus on real-life challenges and learning by doing, EIT Climate-KIC’s online learning, and professional development and graduate school programmes are the most transformative of their kind. Our entrepreneurship programmes identify, support and invest in entrepreneurs through every stage of innovation, helping them achieve success and commercial scale. Our innovation programmes facilitate knowledge exchange and technology transfer to help your business or sector to maximise its knowledge potential to become a market leader. Introduced in 2014 to share good practices and experience emerging from EIT Community activities and to widen participation across Europe, EIT RIS opens the activities of our Innovation Communities to innovators that are not partners, by providing targeted support to individuals and organisations to take part in and benefit from our Innovation Communities’ activities, services and programmes. We are currently present in Bulgaria, Croatia, Cyprus, Estonia, Greece, Latvia, Lithuania, Malta, Portugal, Romania, Serbia and Slovenia. Sandra Vlasic for Climate-KIC Hub Croatia	"Being a part of Climate-KIC is like joining the champions team of 300+ European organisations playing the most important match of our lives." In all EIT RIS countries we work with (competitively selected) organisations to set up EIT Climate-KIC Hubs which serve as entry points for interacting with local players, mobilising and internationalising local networks as well as facilitating Knowledge Triangle Integration. Lisboa E-Nova for Climate-KIC Hub Portugal	"Climate-KIC allowed us to create a plan and an articulated strategy with the Municipality of Lisbon. It has been a program of enormous added value."